It's SPRINGTIME, but it's starting to feel more like summer than spring. The wind is cool and invigorating, but the heat is there! And often times when this happens, we long for the sandy beaches, enjoyable cold drinks, and some yummy ice cream. What's summer, or spring in our case, without ice cream? But, what happens if you don't want that delectable creamy confection, and you're looking for a suitable alternative? Enter Bobboi. A quaint gelato shop tucked neatly into La Jolla's beachy area on Girard Ave. Inside it feels very homey with tiny vases of succulents on the windowsills, untreated wood floors, and light wood paneling on the walls as well as the same of their chairs and tables. It feels like you're in your backyard. Small, but very inviting, as the staff are incredibly helpful and pleasant. Then I met the co-founder of Bobboi, Andrea Racca, who is a complete reflection of his staff members (or perhaps that is vice-versa). 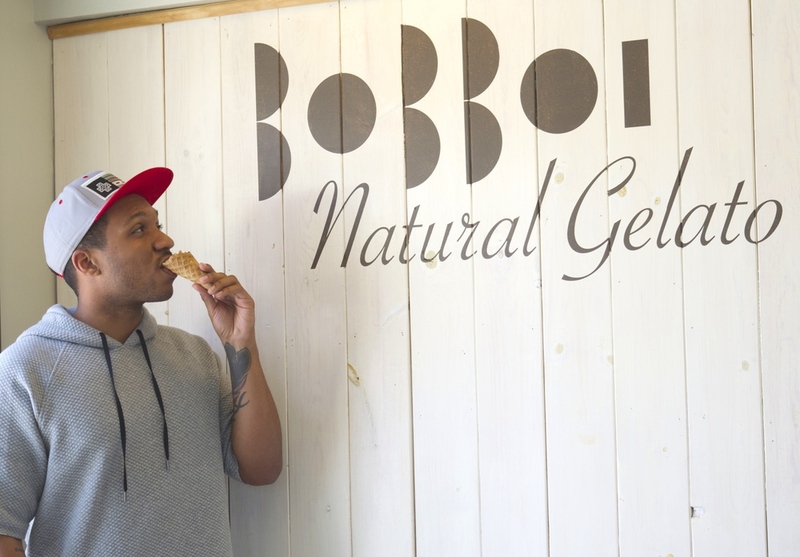 He graciously walks me through the many flavors that are housed in Bobboi, some being seasonal, and 70% of the ingredients are fresh and organic! The first gelato that is tasted is the Banana Nut Bread. Hearing it, you think it can't possibly work, but once it hits your palette, you are convinced that it more than works. Racca's wife makes the banana nut bread specifically used in this gelato, and it is instantly a hit. The next flavor that is tried is the Bacio, which is Valronha chocolate and Italian hazelnut. the chocolate and hazelnut are married exquisitely. The dark chocolate sorbet is non-dairy and so rich! With the next flavor, as well as the Mediterraneo, which has pistachio, hazelnut, and almond. They use locally grown pistachio from Santa Barbara, and most of the ingredients are local. Next up was the Salted Caramel and it's their best-seller for a great reason: CARAMEL!! Who doesn't love the sweet and savory combo of rich caramel, melting in your mouth? It's decadent, but the ante was beaten by a special flavor this only going to be featured for the week of Mother's Day. 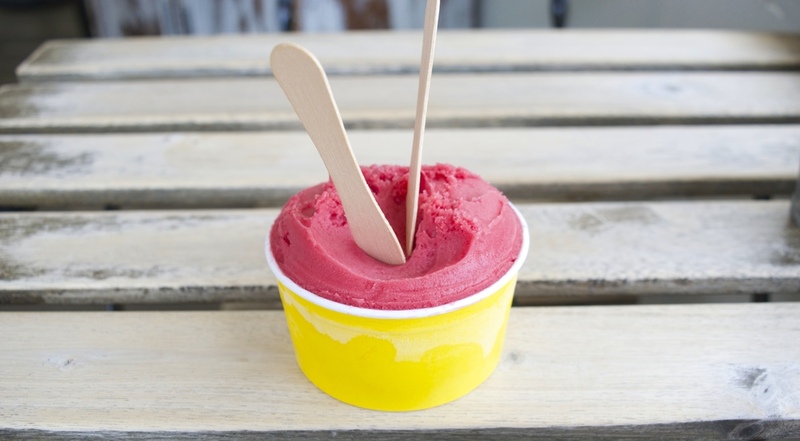 The Mimosa Sorbet sampled is made with blood orange and will not be made after Mother's Day. Hands down, one of the most refreshing treats I've ever tasted. The waffle cones are crispy until the very end and can be complemented with a mean cup of espresso. 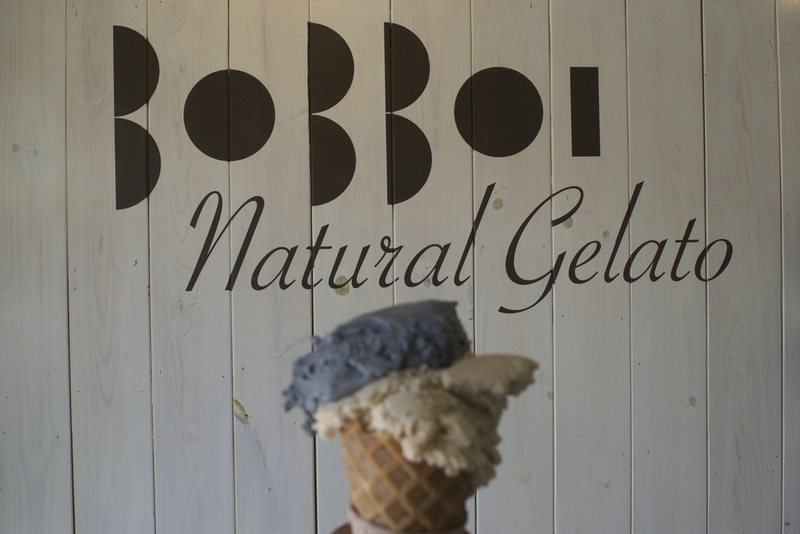 So if you should find yourself strolling through the La Jolla cove area, and want authentic gelato this is incredibly well-made, extraordinarily fresh, and has unique flavors like Charcoal Vanilla, Bobboi is THE choice!